Still a decent pub, no problems with the locals, efficient barmaid, 8 pumps with 7 ales on; I had Stonehouse 'Station Ritter' [smooth pint], Salopian 'Oracle' [zesty, tasty pint], & Mad dag Brewing Co. 'Stouty McStoutface' [ a nice smooth pint]. Still just okay and still suffering from obstructionist locals. Decent tidy pub, tables placed out front for smokers, friendly & helpful barmaid. 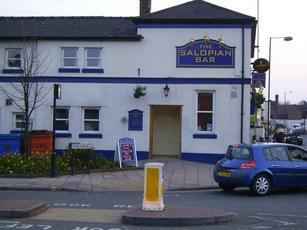 8 ales on, I had Salopian ''Treasure Trove'' [tasty pint], Brass Castle ''Misfit'' [tasty with citrus hints] & Salopian ''Lemon Dream'' [ nice pint with, yes, lemon flavour]. A lot of local ales on at this pub, didn't bother making a note of them but I went for Hobsons Best Bitter, at 3.10 it was nice and well kept. The barmaids were quite friendly and the bouncer on the door was a decent lad as bouncers go (he wasn't intimidating and was fairly laid back). The bar is an L shape and there's a reasonable amount of seating around the bar. I would like to stress that this place is more like a 'bar' not a pub, it had Spanish football on the television and house music playing when we were in. The only thing about this place was some of the clientele in the bar when I was in here. I'm sure the barmaid who served me didn't appreciate the way they kept asking her for her number and I found the conversation of a couple of other lads taking about 'no means yes' was quite frankly disturbing. But I won't judge the bar on this, they advertise that they do a happy hour during the week with the ale being 2.50 a pint. Although this is a great pub the locals seem to not give an inch of space to pass them. Plenty of seats available but they choose to sit in a pathway near the bar that blocks your route to the toilet. Also try getting past them in the pub itself, oh and yes an excuse me was said.